Dreamtime - Commentary Inspired By Bob Dylan's Theme Time Radio Hour: "Kiss" - 101st Theme Time Episode Airing Tomorrow? "Kiss" - 101st Theme Time Episode Airing Tomorrow? 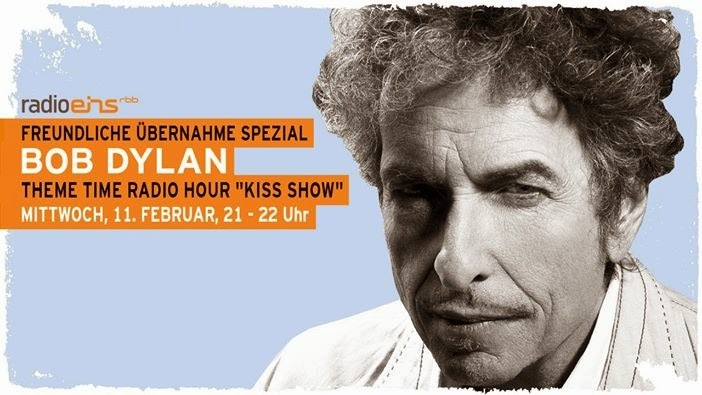 A post in the Expecting Rain forums brought the unexpected news that German radio station RadioEins has announced that they will exclusively broadcast an "unknown" episode of Theme Time Radio Hour this week titled, "Kiss." The episode is scheduled for this Wednesday, 2/11/15, at 2100 (9:00 PM) CET / 3 PM ET. According to promotional material issued by RadioEins, the special is running as part of its "Friendly Takeover" series where musicians host and play their favorite music. Theme Time Radio Hour's 100th episode, "Goodbye," concluded the original series six years ago, on Wednesday, April 15, 2009. The heretofore unknown "Kiss" episode is noted by RadioEins as "never broadcasted," indicating that the show is likely to be an unaired episode from the original TTRH series rather than Dylan returning to the airwaves.